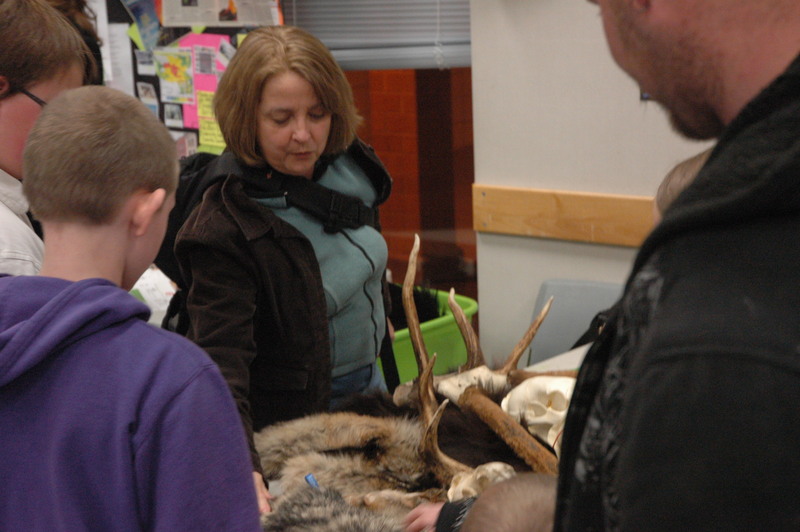 Western Wildlife Outreach Director attends a sponsored event. City of Selah and Washington Department of Ecology for funding storm water education for Selah students, teachers, and the public. Grant County PUD for a grant funding Salmon in the Classroom for 12 tanks in Grant county and 3 tanks in Chelan County for 2013. West Valley School District for funding through a CTE grant for 7th grade student field trips to the Cle Elum River to learn about salmon life cycle and Cle Elum Dam and the related technology. BPA Kids in the Creek for a grant for water quality & macroinvertebrate education. Western Wildlife Outreach for a grant for carnivore education. Yakima School District for a grant for environmental education for Lewis & Clark Middle School. Cle Elum Kiwanis and MTH Septic for funding the Port-a-potties for the salmon spawning field trips. Tom Carpenter for donating a storage container. WDFW for an ALEA Grant to repair Salmon in the Classroom chillers and to purchase water conditioning chemicals for the tanks. Roy Farms and Tree Top for Salmon in the Classroom tank sponsorships. Dr. Hamilton & Carol Licht, and Chuck Klarich and Charlie de La Chapelle for generous donations to YBEEP. Priest Rapids Hatchery staff, WDFW, for carcasses for salmon dissections, and for salmon eggs for 100 Salmon in the Classroom tanks! All Valley Sheet Metal for providing a pick-up to transport salmon carcasses, and to Jim Bishop for volunteering his time to drive. Tom Carpenter for the loan of three bins to store salmon carcasses in and to Yakama Nation Fisheries for freezer space for carcass storage. Abbotts Printing for donating the printing for our YBEEP brochures. U.S.F.W.S., Alaska, Cal Dunham, Alaska, Claudette Moe, Bruce Heizer, Alex Heindl, & Jeff Miller for new furs & skulls for our Furs, Feather, & Bones Trunk.